Do We Need to Modify Dharma for the 21st Century? Photos of Ven. Khenpo Tsewang Rinpoche with tigles before teaching at Padma Samye Ling on April 15, 2019. What Makes a Truly Qualified Teacher? Photo of Ven. Khenchen Palden Sherab Rinpoche in Russia in the 1990s. “Dharma practice means celebrating goodness. 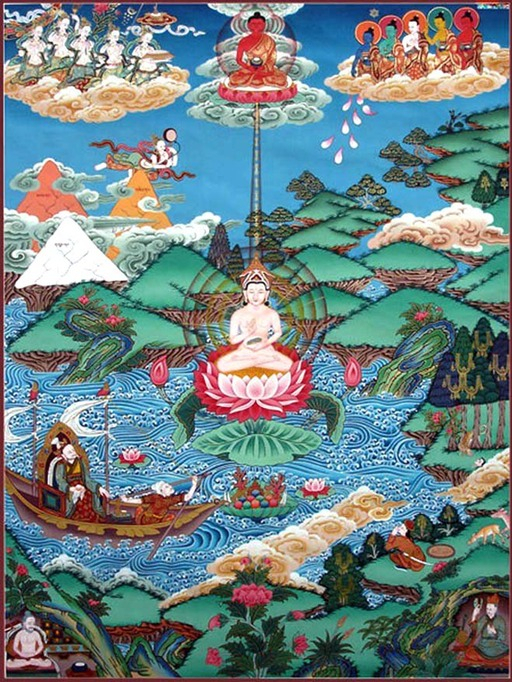 “Buddha Shakyamuni taught that there are infinite world systems containing an infinite number of sentient beings. Therefore, there are also countless emanations of enlightened beings to help with their awakening. There are thirty-six other world systems that are near our own. Each one has a different emanation of Guru Padmasambhava. We will tell you about one of these worlds. 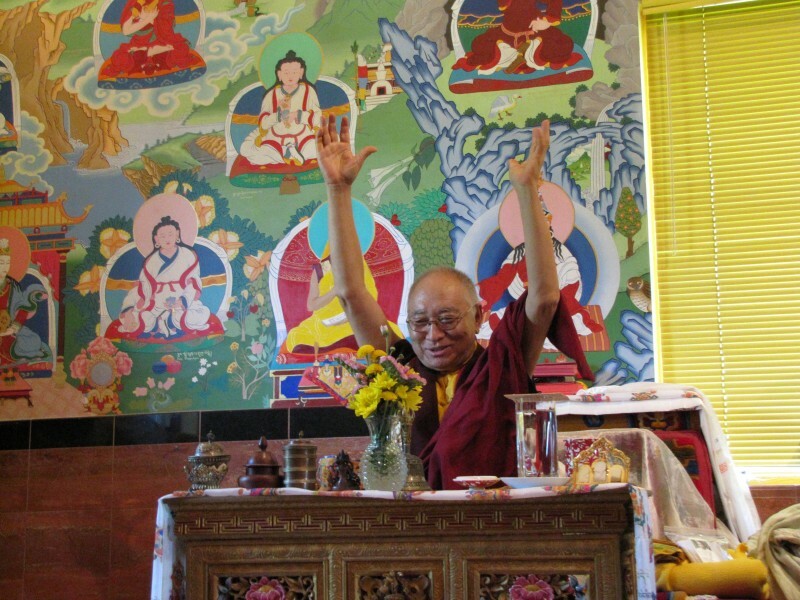 On April 16, 2013 at Padma Samye Ling during the One Month Dzogchen Retreat on Mipham Rinpoche’s Vajra Heart, Khenpo Tsewang Dongyal Rinpoche taught essential practice instructions that we need to remember as meditators and Dzogchen practitioners. 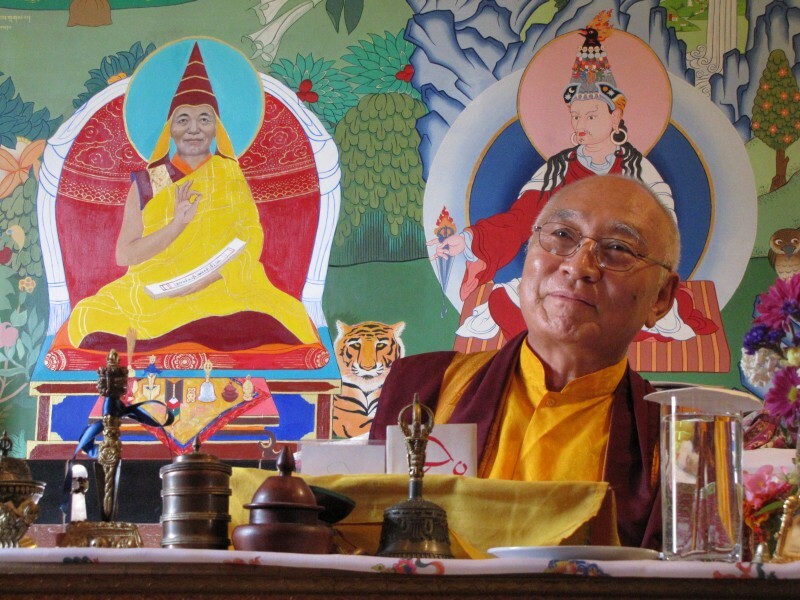 Khenpo Rinpoche’s translation and commentary on Mipham Rinpoche’s text gives us exact advice on how to practice to gain complete enlightenment. 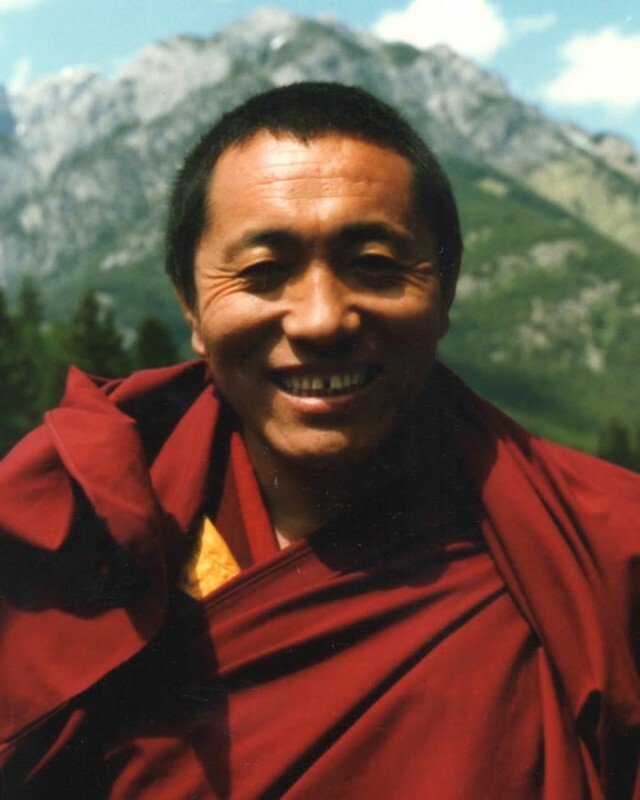 Khenpo Rinpoche’s personal commentary begins at 2:40. Enjoy this exceptional treasure!!! On March 26, 2013 at Padma Samye Ling during the One Month Dzogchen Retreat on Mipham Rinpoche’s Vajra Heart, Venerable Khenpo Tsewang Dongyal Rinpoche gave pointing out instructions on how to bring everything together in our Dzogchen meditation. Excerpted from the 2017 One Month Dzogchen Meditation Retreat led by Ven. 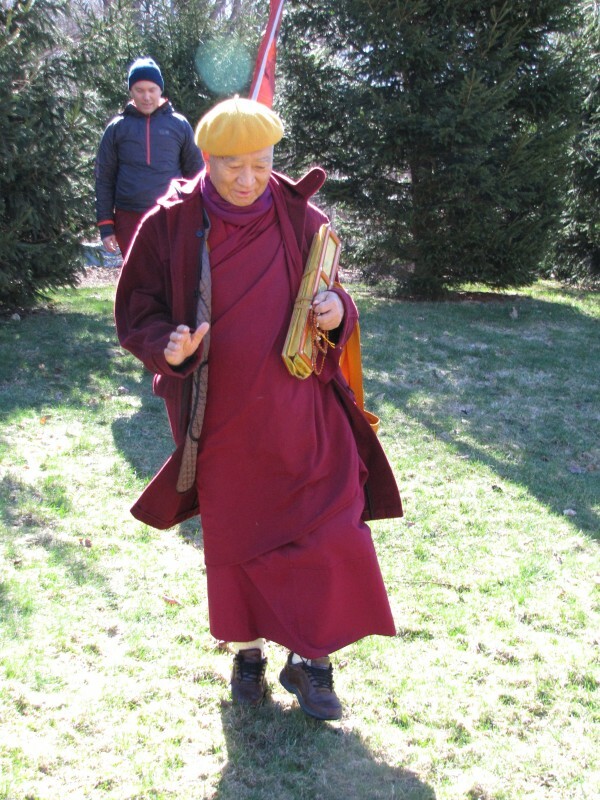 Khenpo Tsewang Dongyal Rinpoche on Lama Shabkar Tsokdruk Rangdrol’s Clear Light Luminosity of the Great Perfection: A Song of Spontaneous Leaping Over That Instantly Opens Hundreds of Doors of Samadhi, on April 20, 2017 at Padma Samye Ling. 1. 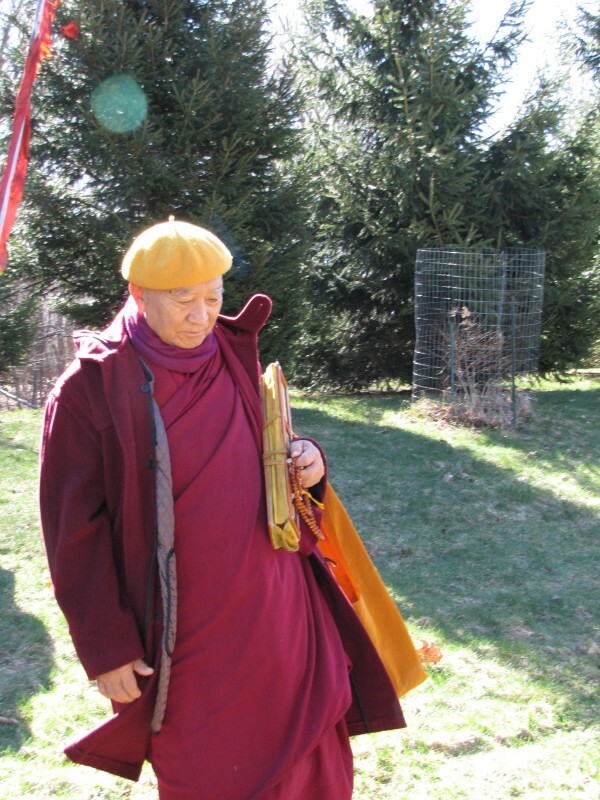 When we begin Vajrayana practice and “open the mandala,” what are we opening to? 2. What should we do about the negative karma we previously created? 3. Is it a mistake to look at a teacher as a buddha if (s)he is not a buddha? 5. How to not be attached to this life? 6. How to calm an incredibly over-active mind? 7. What are the benefits of practicing together as a Sangha? 9. What role does desire play on the path to enlightenment? Photo of Ven. 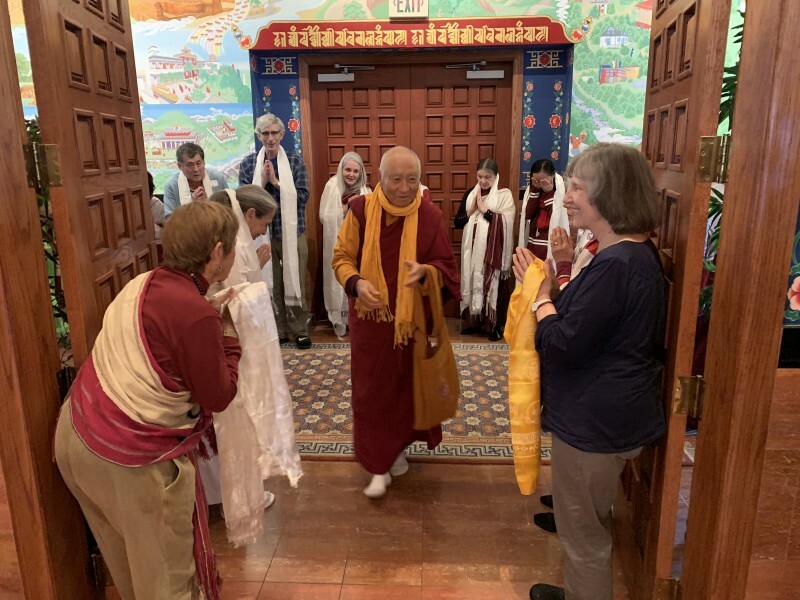 Khenpo Tsewang Dongyal Rinpoche greeting the Sangha at Padma Samye Ling on April 6, 2019. “Joyfully rejoicing in virtue is very important and is a direct antidote to jealousy. There are two types of rejoicing: (1) rejoicing in the good deeds of others and (2) in the good deeds of ourselves. The teachings say that it’s so important to rejoice in all good deeds. First, we rejoice in the good deeds of others. The bottom line of our motivation is to benefit all beings. This is our goal and motivation. We recite this all the time: “May I benefit all sentient beings.” But by ourselves alone, we can’t really benefit everyone—only on the mental level of our aspirations. Practically speaking, on a physical level we can’t help everyone. Therefore, if somebody else is doing good things to benefit others, we have every reason to rejoice and be happy with that rather than making comments and criticizing them. We should be happy. Their motivation and activity is so special and beautiful, whether it’s affecting others in a smaller or larger way. This is what benefiting others means—it means making everyone happy and easing their suffering, sadness, and the difficulties and troubles they’re going through. Any way we can help others is wonderful, special, and beautiful. In the Buddha’s teachings it says that even if you can’t do an activity that benefits others, by simply rejoicing when other people do good things, you’ll get the same merit as them. It’s like when someone changes a light bulb— even though only one person actually replaces the bulb, everyone else gets to experience the benefit, just as if they all changed the bulb! Similarly, rejoicing in others’ good activities is a very skillful means, and you don’t have to do anything! Just sit back and think, “Wow, this is so great.” Buddha Shakyamuni and Guru Padmasambhava both said that by rejoicing you receive the same benefit as the person who actually performs the activity. So let them do the job! We can just feel happy with that. In one way, this is very simple, but it’s also very special. Rejoicing also benefits others by inspiring them to do more. They will feel happier, excited, and supported. This is our practice. 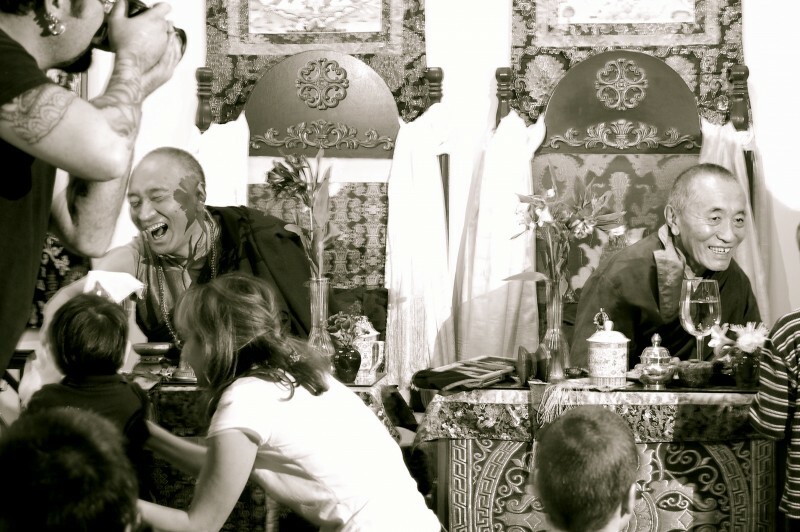 Making others happy is our job—it’s bodhichitta’s job. 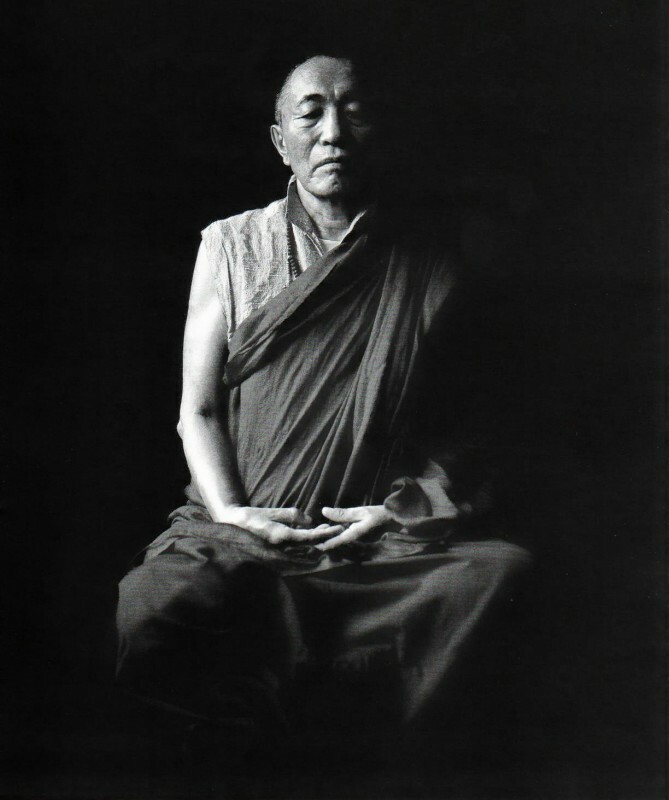 Bodhichitta means making everyone happy and peaceful so they feel nice and comfortable, both in the short and long term. That’s really the goal of Buddhist practitioners. Creating suffering, sadness, and difficulties for others is not the Buddha’s teaching. We all know this. As much as we can make everyone happy, peaceful, and joyful, that is really good. Of course, I’m talking about rejoicing as a Dharma practice, but we should also rejoice when someone does anything good, even if it doesn’t have a spiritual name or isn’t an official Dharma practice. Doing good things like humanitarian projects and social work are wonderful. They really benefit and help others, creating peace and harmony in the world. When anybody does this, we should feel happy and pray, “May I be able to act similarly in the future.” Wishing for this and joining with their good activities is so special. Later King Prasanejit became so devoted to the Buddha. He often invited him to his royal palace to offer him lunch, along with his monks and nuns. This happened so many times. There were many beggars around the palace. In particular, there was an older beggar who thought, “How wonderful and beautiful that King Prasanejit has so much merit to become such a great king, and still he’s continuing to do such big meritorious activities. If I ever have the capability, I will also do the same thing for the Buddha and all these bodhisattvas and arhats.” She thought this sincerely from her heart. In the teachings it says that she accumulated the same merit as King Prasanejit because her intention joined with his activities. The mind is so powerful and special. Everything we do starts from the mind. All visible activities come from this invisible mind. Whether we see it immediately or not, everything is connected to the mind and it affects every level of every system. This is why rejoicing is so important. 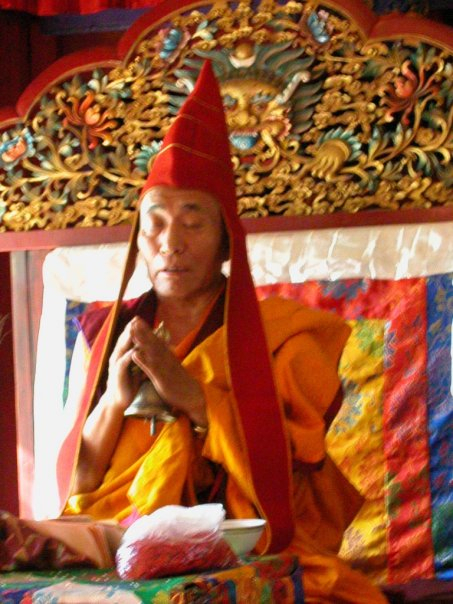 Photo of Venerable Khenpo Rinpoches at PBC Palm Beach Dharma Center in 2008, by Derek Sarno. “The teachings always mention that individuals should spend time in hermitages and go to the mountains until they stabilize their realization because there are fewer distractions. Mountain retreat means “hermitage”—it is one of the best places to make yourself strong so you are not disturbed by all the fears and habitual patterns that are not healthy for anyone. Practicing in a hermitage makes it easier for the old habitual patterns that prevent our realization and disturb our peace of mind to subside. That is why the Buddha and Guru Padmasambhava always recommended practicing in mountain retreat. Photo of Ven. Khenchen Palden Sherab Rinpoche in Vancouver in the 1990s.